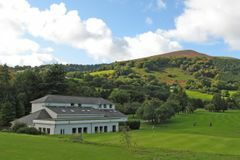 Nestled in the beautiful Usk Valley between Blorenge and Sugar Loaf mountains you will find Monmouthshire Golf Club. The beautiful course, designed by James Braid in 1892, provides a great challenge to all golfers where you can enjoy a round whilst you take in the stunning views that surround the course. The beautiful parkland course was designed by James Braid in 1892 one of the most renowned golf course architects in history. The course runs along the River Usk within the valley of the same name. The amazing scenery of the area will take your breath away as you enjoy your walk around the course, however you must be sure you do not get too distracted and take your eyes off the course. The classic tree-lined design will reward accurate tee shots and your approach shots need to also be well-struck and thought out as any errant shots can catch the strategically placed bunkers. The clubhouse and facilities have been recently refurbished so you can enjoy a drink and a bite to eat as you look over the immaculately presented golf course and the stunning views beyond.